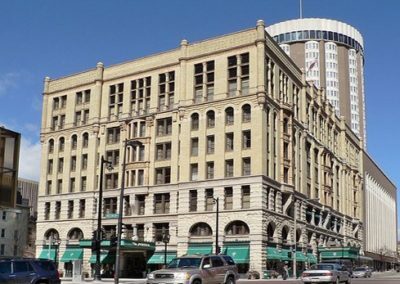 Provide historic restoration and design new decoration to ensure the Pfister Hotel celebrates a century of operation in the pinnacle of decorative splendor. 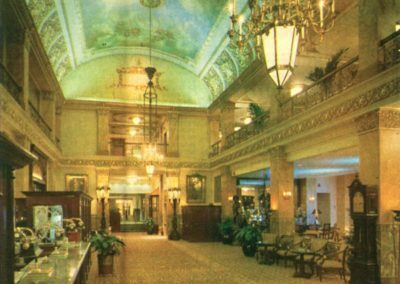 For many years, the 1893 Pfister lobby offered a warm gathering place for guests and local visitors alike. Its grand fireplace provided an inviting venue to greet friends. 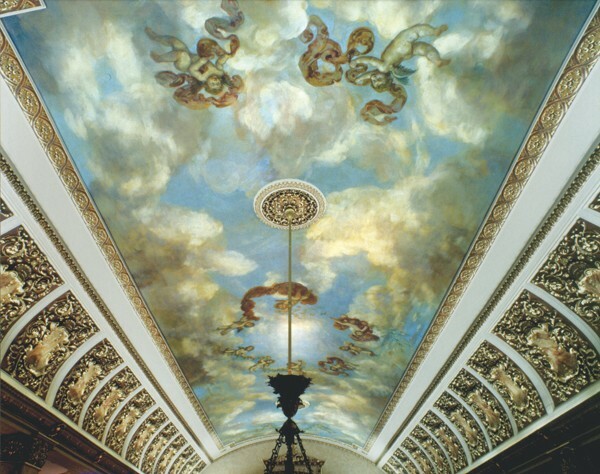 As part of the renovation project leading up to its centennial celebration in 1993, the Pfister called on Conrad Schmitt Studios to create a new mural in the spirit and grace of the lobby’s 1893 vaulted skylight and conduct painting restoration to reinstate elegance to the Imperial Ballroom. In 1893, the original lobby ceiling was an open skylight until architects added a roof enclosure in the late 1930s. The once lively vaulted skylight was over-painted with layers of non-historic solid-tones and surrounded by white ceiling panels. This lackluster decorative approach greatly diminished the lobby’s inherent sense of welcoming. Guido Pfister intended the hotel to be a place of splendor and comfort. The impressive columns, figured hardwoods, ornamental plaster highlighted with gold leafing, etched glass, lavishly patterned carpet, oil paintings and treasured artworks create an atmosphere of Victorian luxury for everyone to experience. 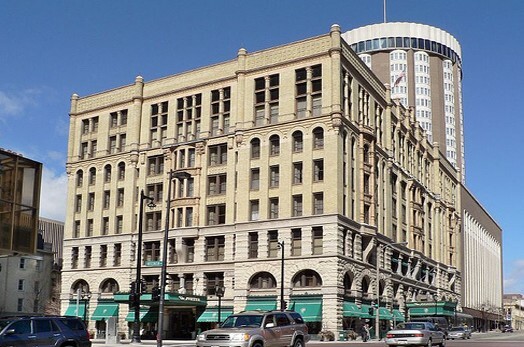 What the CSS team found in the Pfister Hotel lobby was dirty, tired, and in need of rebirth. Within the lobby, the ceiling was thoroughly cleaned and primed, while sketches and stencils were created and approved. 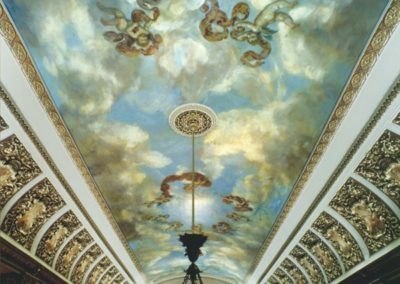 CSS muralists painted directly onto the vaulted ceiling, highlighting with hand-painted gold leaf. The soft, sky-blue scene of ethnically diverse cherubs alighting through subtle clouds framed with 26 warm, red shields, recalls the lobby’s original skylight. Central to the overall presentation of the ornate main lobby, the mural creates a sense of breathing room. Their work in the lobby has become one of the Studios’ Milwaukee Wisconsin showpieces.